Intel's 8th generation Coffee Lake CPUs are now finally "available" and with plenty of reviews around, we get to see what Intel's move to a six-core mainstream lineup has to bring to the table, offering good performance but suffering from lousy availability, a need for a completely new motherboard and the choice to still use TIM. 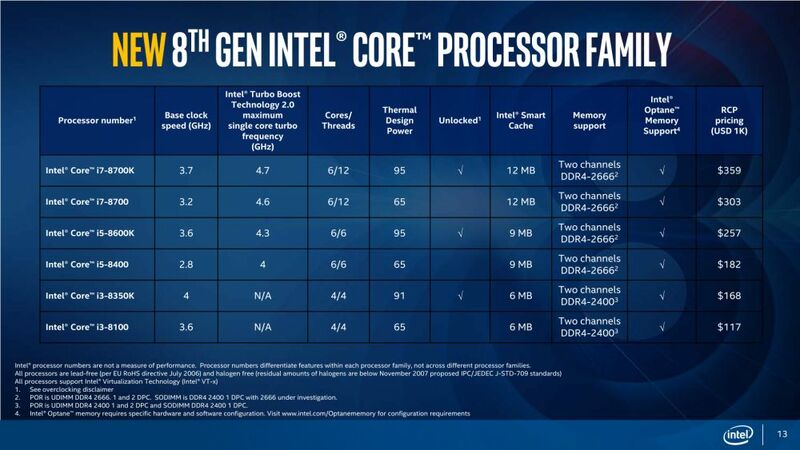 As detailed earlier, Intel has launched a total of six SKUs, including two Core i7 parts, the Core i7-8700K and the Core i7-8700; two Core i5 parts, the Core i5-8600K and the Core i5-8400; and two Core i3 parts, the Core i3-8350K and the Core i3-8100; as well as the new Z370 chipset. As you probably already know, Coffee Lake CPUs are based on the same 14nm manufacturing process and pretty much the same architecture as the Kaby Lake CPUs, with improvements in the process which allowed Intel to get more cores and higher performance at almost the same TDP. The GPU remained the same but with slightly higher clock speed. The star of the show is Intel's Core i7-8700K, a 6-core/12-thread SKU with 12MB of L3 cache, 95W TDP and running at 3.7GHz base and 4.7GHz Turbo clocks. Priced at US $380, it challenges AMD's Ryzen 7 8-core lineup, offering both competitive pricing and incredible single-threaded and gaming performance. The bad side of the story is that Intel's 8th gen Coffee Lake CPUs need a completely new Z370 chipset motherboard. Although both the Z270 and Z370 share the same LGA 1151 socket, a different pin configuration makes these new Coffee Lake CPUs incompatible with Z270 chipset motherboards and there won't be any BIOS update that will change these things. Since the Intel Core i7-8700K has already been delidded, it has been confirmed that Intel is still using thermal paste between the IHS and the CPU die. It also shows that the Coffee Lake die is slightly larger than the Kaby Lake one, which can be attributed to the increase in core and L3 cache size. One thing that plagues Intel's launch is the limited availability, which, according to some reports, will last until early 2018. Although officially available as of yesterday, you will have a hard time finding Intel's 8th gen Core Coffee Lake CPUs and adding the cost of a new motherboard does not make things easier for the consumer. In any case, Intel's Coffee Lake is finally out and it packs quite a punch by offering great performance in games, good overclocking potential and, most importantly, competitive price.